Dating to the 1800s, modernized Tuomarniemi manor offers free a Wi-Fi and a well-equipped kitchen including dishwasher and washing machine. Views looks out over Lake Viinijärvi from the villa’s balcony and terrace. 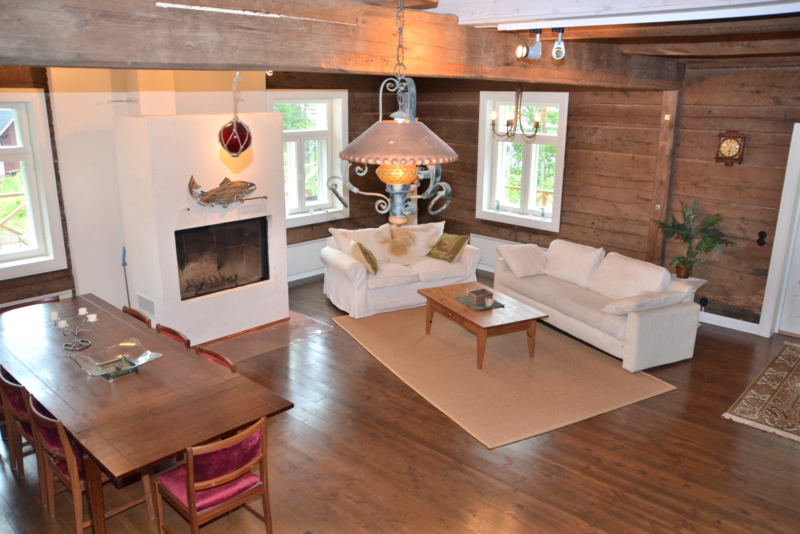 The light and spacious living area at Villa Tuomarniemi has sofas, a fireplace and a flat-screen TV with a DVD player. There is also a dining area and an outdoor space for preparing BBQ meals. A smoke sauna by the lake is available to rent, an electric sauna is available free of charge. Fishing is popular on the lake, You can rent a boat, and Outokumpu golf course is only 16 minutes’ drive from Villa Tuomarniemi. Outokumpu is the closest town for grocery shopping, while the large town of Joensuu is a 35-minute drive away. 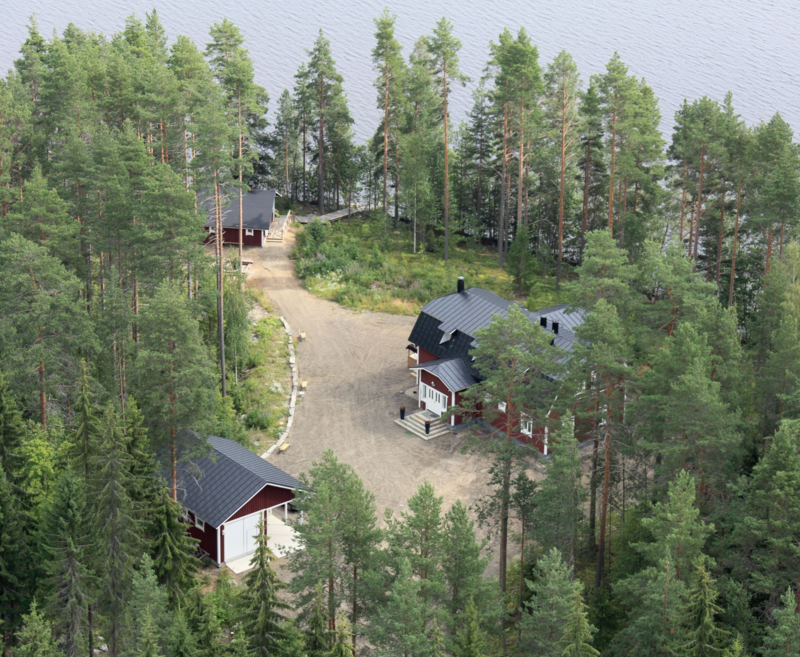 Villa Tuomarniemi can accommodate only one group at a time. The manor has 3 bedrooms for 3 persons and 1 bedroom for two persons. The use of electric sauna is included in the rent, the smoke sauna and the hot tub are available at an additional cost. The customer can bring the bedsheets itself, or rent them from us. The Villa operates on self-service principle, the manor is accessed by key code. On departure, the customer will clean the manor for the following clients, or have a final cleaning service as an additional fee. At departure, the customer is also responsible to secure that all external doors of the manor 3 and the outside door of the sauna are locked when the customer leaves Tuomarniemi. On booking, any additional services, such as bedsheets or final cleaning, are available. Check-in from 16.00, check-out until 12.00. Attention! Economy-Price category manor dining room and 2 bedrooms are not available to the customer. A unique destination, a meeting in Tuomarniemi is remembered! In summer fishing for zander, in winter ice-fishing for perch - make your own contest! Rowboats, equipment for fishing, games, trampoline, badminton court as well as many other great activities! These terms are valid for the Tuomarniemi manor house. The customer accepts the terms when make an reservation, or he paid the advance payment stated in these terms of contract,t or the advance payment and the remaining balance together to Tuomarniemi. The customer receives an invoice, which includes name and address of the resort, directions to the place for the key-pickup or the resort, as well as the necessary instructions for the payment of the rent. All information regarding the invoice has to be communicated within 7 days after invoice writing. The invoice has to be paid as SEPA transfer (IBAN account number and BIC code of the bank), stating the subject number from the invoice. The reservation counts as confirmed, if the customer provided the advance payment until the due date (30% of the lodge's rent), or if the customer paid the advance payment and the balance in one. The remaining balance is due at the latest 30 days before the first day of vacation. Should payment or date not be kept, then the reservation can be cancelled without separate message to the customer. The illustrations of the furniture and the equipment may vary from the actually present furniture and equipment. In the presentation of the accommodation, services available in the vicinity are stated. Tuomarniemi can not guarantee, that the services stated (e.g. train station, bus station, restaurant, shop, ski run etc.) are available during the residence time of the customer. The general services, which do not belong to the vacation destination, are not included in the contract, their mention is not binding. Depending on the time of the reservation and the approximate time of arrival of the customer (communicated beforehand), the keys to the lodge are either handed over on site or picked up by the customer at a place agreed upon separately. Should the customer not arrive to the time agreed upon or should he not communicate the time of arrival in advance, Tuomarniemi cannot guarantee the handing-over of the keys. The lodge (or individual rooms) is available for the customer in the reserved time from 4 p.m. on the day of arrival until 12 a.m. on the day of departure. The lodge rent includes furniture, mattresses, blankets and cushions, dishes, cutlery and thermal energy for cooking and illumination. Bedsheets and towels are not included in the rent, the customer has to bring them, or rent from Tuomarniemi. The use of bedsheets is required. The sauna and the rowboat can be used for a extra fee, use of electric sauna is included in price. The customer is responsible for the cleaning of the lodge during the vacation and for the end cleaning, if not other stated in a flyer of the lodge. On request, a end cleaning can be ordered for a separate fee. The lodge/rooms can be used by at most as many people, as beds are available according to the leaflet, or as agreed upon during the reservation. Festivities or other events, where the number of the people in the lodge is exceeded for a short time, have to be arranged with the owner of the lodge. There may be extra charge for additional persons. The use of tents and caravans or equipment to be rented (e.g. wooden bath tube) on the property of the resort is not allowed without authorisation of the owner. The bringing of pets has to be communication in advance during the reservation, and pets can only be brought in objects which have the according permission. Pets are NEVER allowed in upstairs, where the bedrooms are located. Smoking is forbidden in all indoor rooms of the resort. Open fire is STRICTLY FORBIDDEN in the whole Tuomarniemi area. The customer is obligated to compensate for damages caused at the holiday resort or its properties to the full extent. Smoking is forbidden in all lodges. The lodge has to be left in a clean way when moving out. 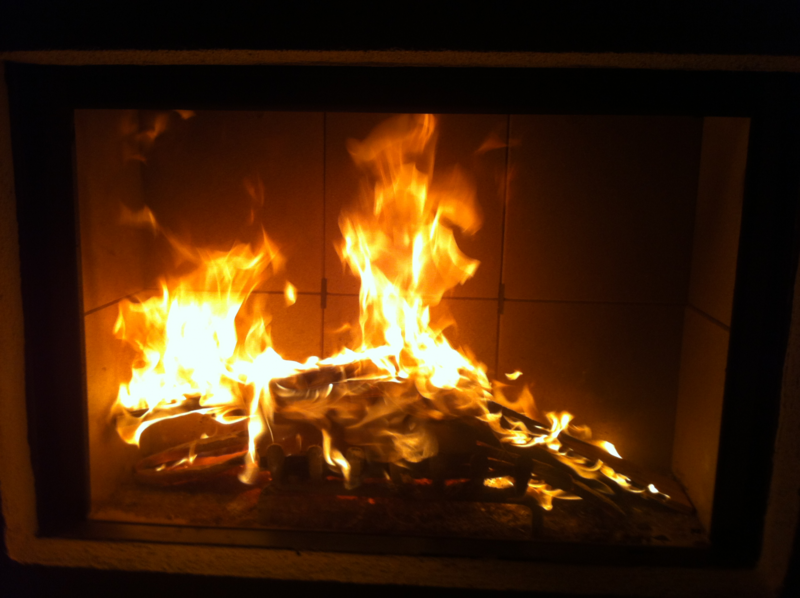 The customer is obligated to pay for the cleaning of the object if there was smoking in the inside of the lodges or if the lodge has not or insufficiently been cleaned and Tuomarniemi has to take care of it before the arrival of the next guest. The manor house and the lodges of Tuomarniemi are not responsible for those damages to the customer, which result from an unpredictable and inevitable event (force majeure) or from a comparable reason (e.g. natural disasters, power blackouts, strike etc. ), which have not been caused by Tuomarniemi and whose consequences Tuomarniemi was not able to prevent in principle. Tuomarniemi is also not responsible for damages or consequences, which result from ordinary natural events. All remarks and complaints regarding the resort have to be directed to Tuomarniemi directly and immediately per telephone or e-mail with the respective event and the respective reservation time. The parties try to solve conflicts resulting from the contract through negotiation. Should there not be an agreement in the negotiation, then the conflicts are brought to the district court Espoo. The Finish law is applied to this contract. 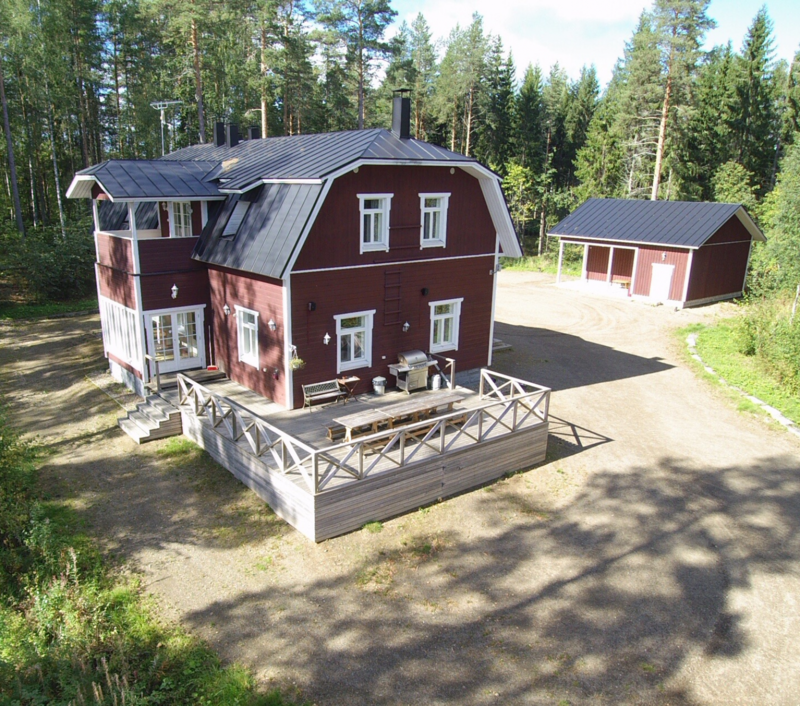 Tuomarniemi has the right to raise the price agreed upon and correspondingly the duty to reduce it after the conclusion of the contract, if the taxes regarding the lodge vacation services or other public costs have been changed. A cancellation always has to be carried out in written form (letter or e-mail) to the Tuomarniemi. Cancellations are effected, when they have been received by Tuomarniemi. Should the customer prove, that he made the cancellation and that he sent it in time to the correct address, then the cancellation is accepted, even if it does not arrive in time or does not arrive at all. In the case of a cancellation we keep the amount of the advance payment and minimum a handling fee of 30 euros. Should the cancellation be carried out later than 30 days before the beginning of the vacation, then we charge the full price of the vacation. Should we be able to rent the resort to another customer, of who we receive the according sum, then we keep the advance payment and the handling fee as cancellation fees. Independent from the stated above, the customer has the right on refunding of the sum paid to the Tuomarniemi (excluding the advance payment and the handling fee), if the customer or a person living in the same household should fall ill severely, have an accident or die. The cancellation has to be communicated to Tuomarniemi immediately and the reason for the cancellation has to be proven to Tuomarniemi in a plausible way, for example through a medical attestation. Should the cancellation be carried out later than 3 days before the reservation period or during the reservation period, we do not refund the effected payments to the customer. Should the customer change the reservation (regarding resort, time of vacation, separate services or number of people), then Tuomarniemi has the right to charge change fees of 25 euros. The change has to be carried out at the latest 30 days before the reservation period. Later changes count as cancellation of the prior reservation and as new reservation. In the case of an inevitable obstacle (force majeure), Tuomarniemi has the right to cancel the reservation. The customer then has the right to a refunding of the whole sum paid to Tuomarniemi. Should payments or payment dates are not being kept, then the reservation can be cancelled without prior notice to the customer. If the reservation has to be suspended because of a disturbing behaviour, then the payment is not refunded.